…then you need to learn how to squat really, really well. Because you’re going to squat a lot. And often. I learned this technique from Marty Gallagher. 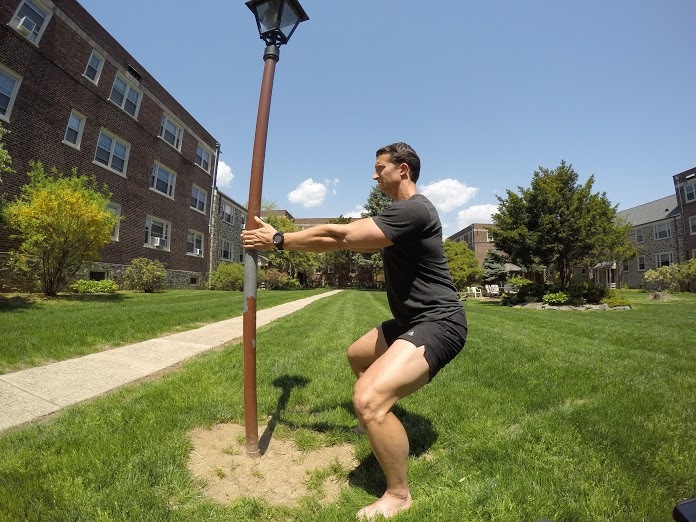 It’s an excellent drill for a weak squatter or someone who needs to learn how to squat properly (Padawan), as well as a great specific warm-up for a proficient squatter (the mark of a true Jedi Master). Whatever your experience level, keep in mind this assumes you should be ready to squat at all, according to your FMS score. 1. Find–wait for it–a pillar. One that is sturdy and can support your full weight. The upright on a squat stand is perfect. Standing arm’s length away, grab the pillar with your fingertips at about the level of your solar plexus. 3. From here, kick your hips back slightly (an ever so gentle hip hinge) to shift your body weight to your heels. You should be able to lift up and wiggle your toes, so do a quick check. But don’t keep them lifted–use them to grip. 4. Begin the descent. Don’t yield to gravity: actively pull yourself down into your squat, walking your hands down the pillar as you go. Try your very best to maintain vertical shins and a vertical torso. Newtonian physics being what they are, it will be impossible not to fall over if you do this without holding onto the pillar (or using The Force). Use as much as you need–but as little as possible–of the help you get from holding onto the pillar. 5. Don’t relax at the bottom of the squat. However, you should find that you’re able to drop much deeper than you could without using the pillar. 6. From here, start to stand back up, but slowly. Take a count of 5 to get all the way up. You’ll feel like you have to compromise your form to make it easier. DON’T. The intention of this drill is to make you better at squatting, not to get away with the easiest way you can still call it a rep.
You should find your midsection is involved much more in your squat than before. Use this! The end goal of this drill is to learn how to get tight where you need to (everything around your spine) and loose where you need to (your hips, so you can reach full depth). Then you can take everything you’re feeling here with this squat and try to apply it to all your other squat variations. 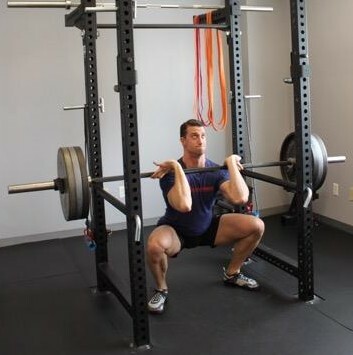 You will likely feel the best crossover with the front squat (below) and high bar back squat. 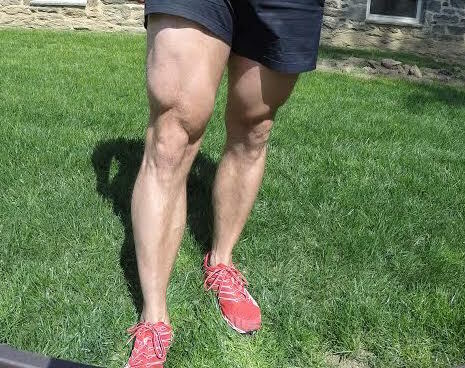 Get to five sets of five reps with five seconds on the way up and down and you should be on your way to squat proficiency and The Quads You’re Looking For.